islamwich – Page 2 – one slice muslim. one slice 'merican. and all that comes between. Pedestals are for Prophets and plants. This has been my mantra since I nearly let someone destroy my heart with their short comings. I put someone high up on a pedestal and it was unfair to them and to me. Pedestals are unstable structures. And that inevitable fall from a pedestal is hard and painful. As a child and a young woman, many of the men in my life were untrustworthy, abusive, and dangerous, with the exception of one shining example. I looked to this one man to restore my trust, to restore my faith in men, to be that perfect example. I created a perfect idea of him and put that fiction up on a pedestal. When that idea of this last man standing finally fell from the pedestal, as it was always meant to fall, it nearly broke my heart. I became bitter, angry, and hopeless until a friend reminded me that I had put him in a place only the prophets are meant to be. Taking this to heart, I began to do the work of learning about the Prophet Muhammad’s (PBUH) perfect character. His life story gave me hope. The more I learn the more I understood what a real man’s character should and CAN be. The more I learned about him, the more I healed. And I started to slowly put him and all the prophets in that highly esteemed place to the exclusion of all others. Honestly, I am so glad that Allah (SWT) allowed the image of the last man I trusted to fall from the pedestal. I am even grateful for the pain it caused me because painful lessons are the best teachers. And so I told myself pedestals are only for Prophets and plants. What happens when we put someone on a pedestal is that we put all our hope in another flawed being, we trust an imperfect person to perfectly pass all the tests of this world, or we imagine that they are here as a perfect example for us. And in the end, we don’t even realize that the object we put on the pedestal is a flawed being- a human. That is until the image we have of them falls and breaks our hearts. Continue reading here on About Islam. Like the post, share it, pin it, and/or do whatever social media magic it is that you prefer. Find out more about us in the understandably named “About” page and browse other posts in “Table of Contents”. Much has been written on what a new Muslim should do after converting. What the first steps after shahadah should be is a topic even I have expounded on many times—like the article I wrote entitled, The First Step A New Convert Should Take which is all about intentions, motivation, and matters of the heart. But sometimes this kind of advice makes it seem as if material matters aren’t important. But you should know that they are. Islam teaches us a balance, to be in this world and to take care of one’s worldly needs while also thinking of the life of the hereafter and taking care of one’s spiritual needs. We are beings of duality. We have a physical existence and a spiritual existence. When the needs of one or the other are ignored, bad things happen. Far too often the worldly needs of new Muslims are brushed off as less important than spiritual needs. And what comes from this kind of treatment is understandable. New Muslims often complain that being a Muslim is impractical or difficult. If the Islam presented to you seems Impossible, excessively difficult, or impractical, know that this is a kind of imagined Islam that ignores the worldly needs in favor of the spiritual needs. However, Islam demands balance and that all needs are met. Here are a few practical things to think about after taking the shahadah. As a new Muslim, one of the first things you should understand about your faith are your rights in Islam. Often new Muslims’ complaints about Islam have nothing to do with Islam at all, but a failing on the part of other individual Muslims or even their community as a whole. It is critical that you, as a new Muslim, understand that Allah has instructed your community to provide you with support. If it is not offered to you, or if support is not given when you seek it, then you need to know that that is man’s failing, and not Islam’s. Muslims have an obligation to help new Muslims in a number of ways, including but not limited to mentorship, counseling, education, supportive community, and even financial support if need arises. You can read a declaration of the rights of new Muslims here that discusses this in more detail. There are so many untruths spreading through the Western world (and have been for centuries) about Prophet Muhammad (PBUH). For those of us who love and deeply respect the Prophet, these egregious fallacies can be hard to fathom, much less refute. But we must answer the hard questions for those who are curious and have been wading through the mountain of ignorant cant about this noble man. And recently, I had the honor to do just that for one brave person who chose to ask a Muslim –and not the number of unreliable sources out there– honest questions that were born out of research into Islam. 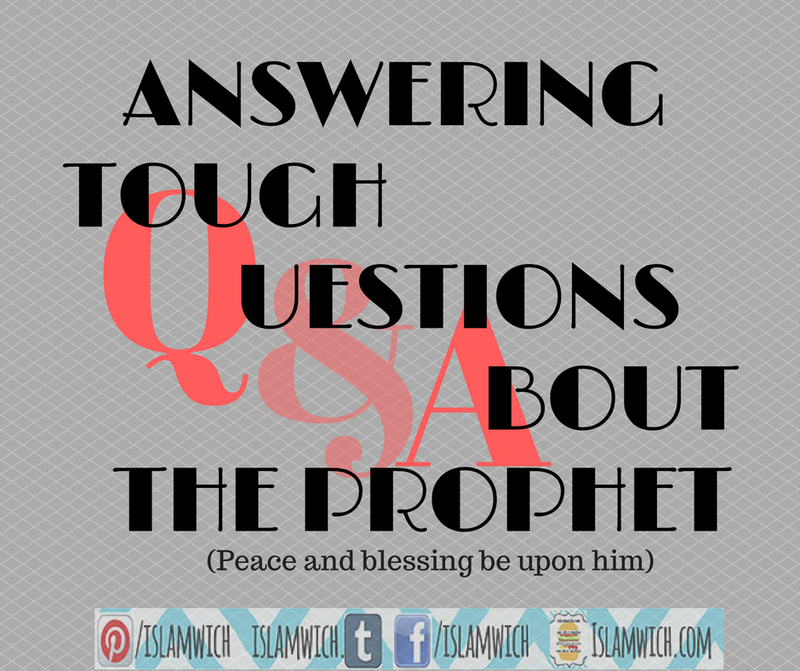 I hope that sharing the following Q&A can help others clear up some of the misconceptions and malicious errors about the Prophet (PBUH), his example, and the message of Islam. Q: Why would Muhammad send followers to loot and raid caravans travelling through Madinah? OK, so it was an accepted practice at the time, but you kind of wish that your prophet could rise above stuff like stealing and killing. A: This is one weapon Islamophobes use to paint the Prophet Muhammad (PBUH) as a war monger. But they don’t seem ever to talk about the context: that would put a damper on the claims they are trying to make. The polytheists of Makkah during the time of Revelation tortured, killed, starved out the Muslims. When the Muslims made their exodus from Makkah for Madinah, they had to do so in secret for fear of being murdered. And that meant they would escape only with what they could carry for a safer place to live and to worship God alone. Ladies and Gentlemen, have I got an excellent deal for you! But Hurry! It’s only for a limited time. Act now and don’t miss out on this incredible offer!! How would you like to leave your current religious community and join mine, for free? Our community is made up of only the best-quality people. Imagine how you’d feel in THIS beautiful religious community! No more broken hearts, no more frayed nerves. Bye bye frustrating unanswered questions! Sayonara, pew-brain! You can kiss those pesky fellows good-bye, because in my 100% certified authentic religious community, there are absolutely no fillers, no artificial people, and no annoying preserved traditions! And if you act fast, we’ll even throw in a tacky hijab or kufi AND a poorly-translated Quran, all for FREE, but only today! Recently, I came across an article written by Reza Aslan on Foreign Policy, entitled, “There Is No Divide Between Islam and American Culture”. In fact an American woman, who recently converted to Islam shared it with me. It seemed to be a lifeline to her as a new Muslim. Even a beacon of hope for her in a tough situation-being attacked by most people in her life for her choice of religion. To me, it was another way of saying the same thing I have been writing about for years. In many ways, I emphatically agreed with Aslan’s piece. I usually do as he has a great way of correcting people’s misconceptions about Islam that is urbane with a touch of “duh, you guys! this is so obvious”. When Aslan called people who think culture and faith are incompatible, naive; I laughed literally out loud. It was fitting. When he put people on notice that they are being emotional when they think Islam clashes with being American, I thought of all the people who have harangued me through the years with this uneducated and unsophisticated understanding. I thought of the engineer who assumed I was not allowed to go to a baseball game. The doctor who told me I was giving up my identity when I told her I converted to Islam. The countless people who are brave enough to ask where I am from and then refuse to believe my answer. I thought of all these people who have come in and usually quickly out of my life. No matter how educated or how well-traveled, they all have an emotional reaction to my existence as an American Muslim. And when plied for their reasons, they can only produce hearsay, anecdotal evidence, and regurgitated propaganda. This reaction to culture and religion is naive and this reaction to Islam is emotional because those who believe Islam is un-American have never measured this conception against facts. The fact is that being as American as apple pie and as Muslim as five-times-daily-prayer is not only NOT incompatible, it is natural and a continuation of Islamic tradition. As Dr. Umar Faruq Abd-Allah writes, “For centuries, Islamic civilization harmonized indigenous forms of cultural expression with the universal norms of its sacred law. It struck a balance between temporal beauty and ageless truth and fanned a brilliant peacock’s tail of unity in diversity from the heart of China to the shores of the Atlantic.